The Dallas Cowboys, in need of a playmaker on defense, drafted defensive end DeMarcus Ware with the 11th overall pick in the 2005 NFL Draft. Eight seasons and 108.5 sacks later, DeMarcus is one of the most dominating defensive players in the National Football League. 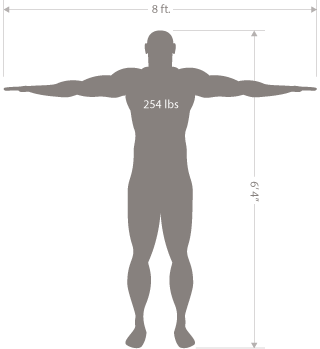 DeMarcus isn’t overly large for the NFL — only 6-foot-4, 254 pounds. Rather it’s the 29-year-old’s speed, agility, quickness, his “motor” that has led him to six straight Pro Bowls. Since the sack became an official statistic in 1982, DeMarcus has six consecutive 10-sack seasons and earned a career- and NFL-best 20 sacks in 2008. Last season, he had 19.5 sacks, only a half a sack away from becoming the only player in NFL history to have two separate 20-sack seasons. He has a franchise record 25 multi-sack games, and quite possibly this season he’ll become the Cowboys’ all-time leader. DeMarcus didn’t even set foot on the field until his junior year at Auburn (Ala.) High School. He had already been a standout in baseball, basketball and track, and his athletic frame fit right in with the Tigers on the football field. As a senior, he totaled 55 tackles with seven sacks and also picked up team MVP honors as a linebacker/receiver. College came calling in 2001 — an option DeMarcus at one point never dreamed possible. His family struggled to make ends meet in eastern Alabama, and despite starring in high school just down Samford Avenue big-time Southeastern Conference powerhouse Auburn University never offered DeMarcus a scholarship. No schools did except for Troy University, about an hour’s drive south. DeMarcus was picked 11th overall by the Cowboys in the 2005 NFL Draft and has made the Pro Bowl IN SIX CONSECUTIVE SEASONS. DeMarcus went on to earn All-Sun Belt Conference honors in his final two seasons, adding a league Defensive Player of the Year award while being named a finalist for the Hendricks Award as the nation’s top defensive end as a senior. He led Troy to its first bowl appearance in 2004 and left with a degree in business information systems, becoming the first member of his family to graduate from college. At draft time, then-Cowboys head coach Bill Parcells, implementing a 3-4 defense, held hybrid defensive end/outside linebackers in high regard. With an impressive NFL Scouting Combine — most notably a vertical lap of 38.5 inches — DeMarcus was taken 11th overall by the Cowboys in the 2005 NFL Draft. His breakout season came in 2006, as “B-Ware D-Ware” became a catchphrase for Cowboys fans. He reached his first Pro Bowl with 11.5 sacks, five forced fumbles and two defensive touchdowns. Then came another 14 sacks in 2007 and a career- and NFL-best 20 in 2008. That year, he had a career-high 110 tackles — his first 100-tackle season — while also leading the team in tackles for losses (eight) and forced fumbles (six). And the sacks kept, and continue to keep, on coming. From 2009-11, DeMarcus earned another 46 sacks. DeMarcus has two children — 4-year-old daughter Marley and 1-year-old DeMarcus Jr. — and kids are near and dear to his heart. He's involved in numerous youth-driven charities and organizations in the Dallas-Fort Worth area. He's also the first NFL player to win the Butkus Award, which is given to the athletes that are committed to playing steroid free. So DeMarcus knows the importance of helping kids make good choices in life, as he and fellow NFL player Reggie Bush delivered encouraging messages to high school football participants at the Red Bull 7-on-7 Game Breakers Finals in Dallas in July 2011. He later signed to represent Red Bull last October. DeMarcus is quite the outdoorsman, too, going all the way back to his days in Alabama. Before he began hunting quarterbacks, he'd hunt “small rodents, rabbits and squirrels and little bit of deer here and there. Whatever you can find.” Then he moved to Texas. A little more info on DeMarcus Ware. Denver Broncos outside linebacker DeMarcus Ware is one of the most dominating defensive players in the National Football League and is on pace to set an all-time sack record by the time he retires.